Draft: 2014, Philadelphia Phillies, 5th rd. Rhys Dean Hoskins (pronounced REES)… Engaged to Jayme Bermudez… 2011 graduate of Jesuit High School (CA), where he played baseball, football and basketball…Attended California State University, Sacramento… Named 2014 Western Athletic Conference player of the year during his junior season… Was honored with the first Champion of Spirit Award at the Greater Philadelphia Muscular Dystrophy Association Black-N-Blue Ball in 2019… 2018 recipient of the Phillies Community Service Award and club nominee for the Roberto Clemente Award… Hobbies: Traveling, hiking, reading and playing with his dog, Rookie (@thelifeofrookie on Instagram)… Signed by: Joey Davis. seventh-fastest in MLB history...Made 149 starts: 133 in LF, 12 at 1st base and 4 as the designated hitter...Homered in both games of a doubleheader twice; was the first Phillie to do that in one season since Hall of Famer Mike Schmidt in 1983...Among all MLB players in their first 100 career games at Citizens Bank Park, had the most RBI (86) and second-most HR (27), trailing only Ryan Howard (31)...His .938 OPS (648 PA) was the second-best mark among all Phillies through the first 150 games of a career (dating to 1900), trailing only Hall of Famer Chuck Klein (1.041 OPS)... Became the first Phillie to slug at least 10 home runs with two strikes in back-to-back seasons since 2009-10 (Jayson Werth, 16 and 13, respectively)...Following the season, was part of the MLB Japan All-Star Series (.167, 2 HR, 3 RBI in 5 games). Finished 4th in NL Rookie of the Year voting despite not making his ML debut until 8/10... Among NL rookies, finished 5th in walks (37), 6th in HR (18) and 9th in RBI (48)... His combined 139 RBI between MLB and MiLB were the most among all professional players and he finished 3rd in HR (47) behind Giancarlo Stanton (59) and Aaron Judge (52)... Began the season with Lehigh Valley (AAA)... Named Phillies Minor League Hitter of the Month for April (.338 AVG, 5 2B, 6 HR, 12 RBI, 11 BB)... Led the International League in RBI (91), OPS (.966), OBP (.385) & SLG % (.581), ranked 2nd in runs (78) & XBH (57), 3rd in HR (29) & total bases (233) and 7th in AVG (.284) & walks (64)... Named the IL MVP and Rookie of the Year... Selected as an IL midseason and postseason All-Star, his third straight season with an All-Star selection (Eastern League in 2016, South Atlantic League in 2015)... Started at 1st base for Team USA in the All-Star Futures Game (1-2), 7/9 at Marlins Park... Set Lehigh Valley's single-season HR record... Reached base safely in 101 of 115 triple-A games (88%), including 23 straight games, 4/8-5/2... Had 4 multi-HR games with Lehigh Valley... Played LF in his fi nal 3 games with the IronPigs, the first such games of his pro career... Had his contract selected on 8/10 and made his ML debut that night vs NYM in a start in LF (0-2, BB)... At the time of his promotion, ranked 1st in the IL in HR (29), RBI (91), SLG % (.581), XBH (57), runs (78) & total bases (233), T-1st in walks (64), 2nd in games (115) and 4th in OBP (.385)... After making his ML debut on 8/10, led all NL rookies in HR (18), RBI (48), walks (35), OBP (.396), runs (37), SLG % (.618), XBH (25) and TB (105)... His 18 HR were the most by any player in MLB history who made his season debut 8/1 or later; previous record was held by Hall of Famer Ted Williams (13 in 1953)... Won the NL Rookie of the Month Award for August (.304, 2 2B, 11 HR, 25 RBI, 12 BB, .402 OBP, .747 SLG %, 1.149 OPS); led all MLB rookies in August in HR (11) and RBI (25)... His 11 HR in August were the most by a rookie in a calendar month in Phillies history... His 25 RBI in August were the most by a Phillies rookie in any month since 1971, when Willie Montanez had 29 RBI in June of that year... Became the 1st Phillie ever to reach 40 career RBI in 40 or fewer games and fi rst MLB player since 2001 (Albert Pujols in 36 G)... Collected his 1st ML hit (single off Chris Flexen) and RBI, 8/13 vs NYM... Hit his first two career HR, 8/14 at SD, becoming the first Phillie to hit his first two career HR in one game since 8/21/96 (Scott Rolen at LAD)... Became the 1st Phillie since 1913 with 4 HR in his first 10 career games and just the second MLB player to do so in 2017 (LAD's Cody Bellinger, 4)... Reached base safely in 19 straight games, 8/17-9/5 (.494 OBP, 25 H, 14 BB, HBP)... Recorded his first career OF assist, 8/17 at SF... Had a 13-game hitting streak, 8/19-31 (.367 AVG, 8 HR, 20 RBI), which tied for the longest among NL rookies... Tied a Phillies record by homering in 5 straight games, 8/23-27; became the 5th Phillie (only rookie) in club history to do it and first since 2008, when Chase Utley did it twice... Started a 7-4-3 triple play, 8/27 vs CHI, becoming the fi rst Phillies OF to do that since 10/2/64 at CIN (LF Alex Johnson to Bobby Wine to Tony Taylor to Vic Power)... Collected his 25th RBI in his 19th career game, 8/28 vs ATL, 2nd-fewest games needed to reach 25 RBI among players who made their ML debut since RBI became an official statistic in 1920, behind CHI's Mandy Brooks (17 G)... Clubbed his 18th career HR in his 34th game, 9/14 vs MIA, the fastest player to reach that many home runs in terms of games played in MLB history... Became the first Phillies rookie to ever have multiple 3-game HR streaks in a season, and he did so in his first 16 ML games... Made 50 ML starts: 29 in LF and 21 at 1st base... Walked twice on the last day of the season, his 50th career game, giving him the most walks (39) by a Phillies player in his first 50 career games since 1928 (Don Hurst, 41 BB); the last MLB player with at least 39 walks in his fi rst 50 career games was CLE's Carlos Santana, 2010-11 (also 39 BB)... Had 23 RBI in September, 2nd-most among all NL players... From 8/14 through the end of the season, among all MLB hitters, ranked 1st in pitches/PA (4.63) & pitches seen (907), T-1st in RBI (47), 2nd in HR (18), 3rd in walks (32), 4th in OPS (1.071), 5th in SLG % (.662) and T-5th in TB (104). Spent the entire season with Reading (AA)... Won Eastern League Rookie of the Year... Received the Paul Owens Award (along with Dylan Cozens) as the best players in the Phillies minor league system... Selected as an EL midseason and postseason All-Star... Finished 2nd among all minor league players in HR (38), 3rd in RBI (116) & total bases (282) and was T-9th in XBH (65) & runs (95)... Led the EL in OPS (.943), was T-1st in SF (9), 2nd in HR, RBI, XBH, SLG % (.566), runs, total bases, walks (71) & games (135), T-4th in OBP (.377) and 5th in hits (140) & AB (498)... Named Phillies Minor League Player of the Month for June (.351, 13 HR, 33 RBI) and was twice named Minor League Player of the Week: 5/16-22 and 6/6-12... Selected as EL Player of the Month for June and Player of the Week, 6/6-12... Named a Baseball America Double-A All-Star and Minor League All-Star... Averaged 1 HR/13.11 AB... Had a 19-game hitting streak, 4/10-5/2 (.293, 22-75, 5 HR, 18 RBI)... Had 3 multi-HR games: 6/4, 7/5 and 8/4... Played for Cibao in the Dominican Winter League. Led the Phillies minor league system in hits (159), 2B (36), HR (17), total bases (258), runs (86) and games (135), T-1st in RBI (90) and ranked 2nd in AVG (.319)... Began the season with Lakewood (A)... Named Phillies Minor League Player of the Month for May (.342, 23 RBI, 18 R, 11 XBH)... Selected as a South Atlantic League midseason All-Star... Batted .363 (33-91) with RISP before being promoted to Clearwater (A) on 6/25... Reached base safely in 57 of 67 games with Clearwater (.394 OBP)... Named Florida State League Player of the Week, 8/17-23. Began his pro career with Williamsport (A)... T-4th in New York-Penn League in games (70) and T-6th in HR (9) and RBI (40)... Participated in Florida Instructional League. June 9, 2018 Philadelphia Phillies activated 1B Rhys Hoskins from the 10-day injured list. May 31, 2018 Philadelphia Phillies placed LF Rhys Hoskins on the 10-day disabled list retroactive to May 30, 2018. Fractured jaw. August 10, 2017 Philadelphia Phillies selected the contract of LF Rhys Hoskins from Lehigh Valley IronPigs. July 13, 2017 Lehigh Valley IronPigs activated 1B Rhys Hoskins from the temporarily inactive list. July 8, 2017 Lehigh Valley IronPigs placed 1B Rhys Hoskins on the temporarily inactive list. March 31, 2017 1B Rhys Hoskins assigned to Lehigh Valley IronPigs from Reading Fightin Phils. January 11, 2017 Philadelphia Phillies invited non-roster 1B Rhys Hoskins to spring training. October 20, 2016 1B Rhys Hoskins assigned to Gigantes del Cibao. April 2, 2016 1B Rhys Hoskins assigned to Reading Fightin Phils from Clearwater Threshers. March 19, 2016 1B Rhys Hoskins assigned to Philadelphia Phillies. June 25, 2015 1B Rhys Hoskins assigned to Clearwater Threshers from Lakewood BlueClaws. April 5, 2015 1B Rhys Hoskins assigned to Lakewood BlueClaws from Williamsport Crosscutters. June 12, 2014 1B Rhys Hoskins assigned to Williamsport Crosscutters. 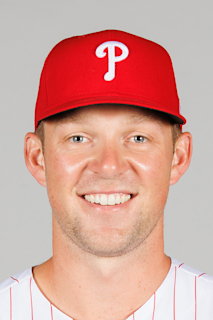 June 11, 2014 Philadelphia Phillies signed 1B Rhys Hoskins.